An ongoing artistic research project on self-organisation, art and public libraries. In the Netherlands (the country where I live), previous years there has been an emergence of self-organised libraries and other book related initiatives. Activists, scholars and artists start libraries for differing reasons: the need for disclosure of forgotten or ignored histories by the mainstream institutions (the Black Archives in Amsterdam). The need for a new meeting place for the local community due to the closing of a branch library because of budget cuts (Leeszaal West in Rotterdam). Should we consider the emergence of self-organised libraries as indirect critiques of existing public libraries? 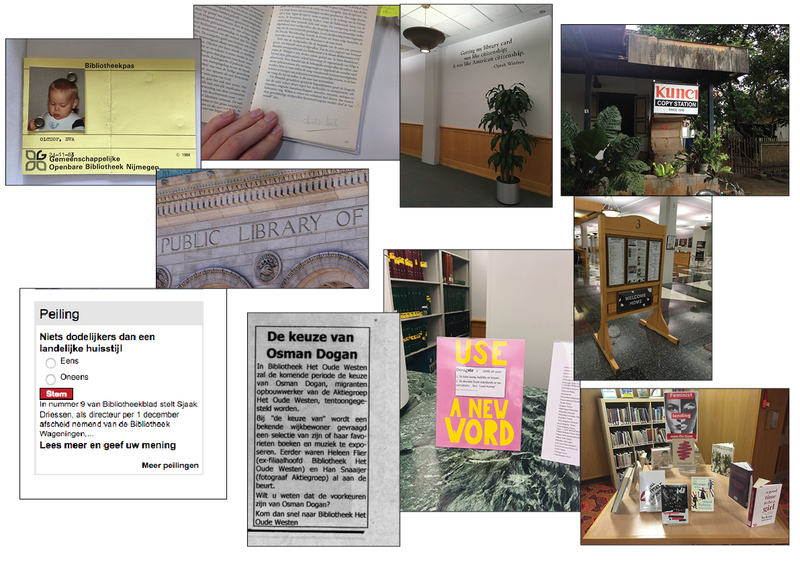 If so, what critiques can we identify and how can we transform these into new ideas and proposals to challenge the status quo of the public library in Netherlands? In the US public libraries play a vital role in the lives of many of its citizens. Because of this fact I visited several public libraries and self-organised libraries in the cities NYC, DC and Chicago, in October 2018. I wanted to see how these different kinds of libraries function (in scale, in collection, in organisation, in communities they serve), how they are challenged - from within by library workers and outside by patrons (or not) - and how they themselves try to challenge their users in becoming an active part of a community (or not). In NYC I visited the Interference Archive, The ABC No Rio Zine Library in Exile at the Clemente, Reanimation Library. All independent self-organised libraries with different aims but all with a purpose to keep and collect those kind of printed matter which is either not or hardly part of bigger institutions, of a larger narrative (Zine library & Interference archive) or not seen as important to keep (reanimation library which consist out of 'out of date' books, content wise, but harbor a very specific aesthetics and visual value). Public libraries I visited in NYC where: New York Public Library, Queens Library and Brooklyn Central Library - where I had the chance to speak to Nora Fisher, who works as an art curator at BCL, about artists potential to animate and transform public libraries. In Washington DC I went to the Punk Archive of the DC Public Library, where I spoke to archivist Michele Castro one of the initiators of this location specific archive. We spoke about how it came about and how they build a community around the collection they have through programming (e.g. by organising Punk concerts in the Library basement for all ages). In Chicago I had the great pleasure to stay with Marc Fischer of the collective Temporary Services - who actively works in libraries (mainly the Harold Washington Central Library) and publishes about his finds in the series Library Excavations through their own publishing imprint Half Letter Press. Together we visited some of the South Side Branch Libraries - libraries that serve some of the poorest neighborhoods in the city. In Chicago I also met with Nell Taylor of Read/Write Library a library made by the community about the community and with April Sheridan of the Joan Flasch Artists' Book Collection at the School of the Art Institute of Chicago. More output in different forms will follow. Many thanks to Simon Kentgens, Laura Almagor, Miriam Mora, Yunjoo Kwak, Doug Ashford, Cora Fisher, Michele Castro, Marc Fischer, Jen Blair, April Sheridan & Nell Taylor !! Earlier phase(s) of the project took place in Yogyakarta, Surabaya & Bandung; Java, Indonesia. An island in a country with few public libraries but many grassroots libraries. In Indonesia there has never been a substantial public library system. Self-organized libraries have filled some of these gaps. In what significant political moment(s) did they arise? What impact do libraries have on local communities? Can a library function as a public safe space that is open to different voices? Which tactics are deployed by self-organized libraries to encourage uncensored and unrestricted access to information? Together with KUNCI Cultural Study Center and Rumah Baca Kommunitas Yogya a discussion was organised on 17 December 2017. In the discussion KUNCI Cultural Studies Center and library shared their founding history just after reformasi, their collection and the way they run it. Rumah Baca Komunitas started in 2012 and runs a ‘fixed’ library and a mobile library (Perpustakaan Jalanan, started in 2014) (Perpustakaan Jalanan) – every sunday they can be found at Alun Alun Kidul where they, aside to providing books, create a space for debate on local issues that directly effect the lives of Jogja citizens. Running-up to this discussion afternoon I visited and met up with several library, publishing and other 'read' related grassroots organisations. Terima kasih KUNCI cultural studies center, Rumah Baca Komunitas Yogya, Zine Library Yogya, C2O library & collabtive, Milisi fotocopy, Ultimus, Gerilya, Perpustakaan Jalanan Bandung, Perpustakaan Jalanan Yogya. Thanks for sharing ideas, tactics and knowledge on libraries and self organization, access to uncensored and unrestricted information, spread of literacy, independent publishing and the commitment to create public spaces to discuss social political issues through the prism of the book and the (mobile) library.